A variety of methods that do not directly involve fire often are used to change vegetation composition and structure and alter fuels to reduce hazard. These include product utilization along with various mechanical thinning and debris disposal techniques. Non-mechanical methods can involve livestock grazing to reduce fine fuels in rangeland systems, or using herbicides to eradicate or suppress unwanted vegetation. These methods can be used wherever they are economically viable, especially where using fire as a management tool is undesirable or carries high risks. One advantage of such methods is that they often can be applied with a greater level of control over the location, timing, and desired outcome of the treatment. Mechanical treatments are particularly suited for fuels management following natural disturbances such as severe storms, intense droughts, or insect outbreaks that radically change forest structure. These aptly named “event fuels” can quickly create hazardous conditions in areas that otherwise seemed relatively benign. An added advantage of mechanical treatments in forested ecosystems is the potential to use the removed woody material for other purposes. Forest thinning might result in excess stocking being utilized as sawlogs, wood chips, or specialty products made from small-diameter trees. If markets exist for the byproducts of the treatment, then there is a greater chance of treatments being economically viable. Commercial timber harvest, as a viable fuels management option, has substantial potential to both offset economic costs and enhance effectiveness in many areas. Sustainable forest management for commercial timber or pulpwood can provide greater access, enhance other resource values, enhance control over both wildfire and prescribed fire, and reduce wildfire threat. To be effective in meeting fuel reduction and forest management goals, treatments must address slash and debris disposal without exacerbating spread of invasive species. Long-term interests of landowners and the strength of local markets will most likely determine the success of offsetting treatment costs. Data explanation: These counties are forested or agricultural with some timber jobs and potential for mechanical treatment [Class ≠ E or F and Cluster = 5 and Timber jobs >100 and Mechanical treatment >15]. Mechanical treatments also are not wholly adequate surrogates for fire in terms of ecological effects, limiting their suitability in various situations. 3.a: Non-fire fuel treatments supported by active timber industry. Opportunities for using active timber markets to offset costs of mechanical fuels treatments in forests were identified by using data about timber jobs, mill production, and forested area available for mechanical treatment (Option 3.a, figure 3.5). These counties occur throughout the Northeast and Southeast, within the Pacific Northwest, and are scattered in the interior West. Data explanation: Non-forested rangelands that aren’t agricultural [Class = E or F and Cluster ≠ 5]. 3.b: Non-fire fuel treatments in non-forested areas supported by grazing or mowing. A second opportunity includes non-forested counties where combinations of mechanical (mowing), chemical herbicide use, or biological control (grazing) appear feasible (Option 3.b, figure 3.5). These include the range and grasslands systems where frequent—even annual—control of vegetation might be advantageous or where it is desirable to alter vegetation composition and structure and limit fire extent. Economic costs and benefits will vary locally and depend on treatment type. For example, grazing rights or leases might be managed in ways that promote fuels management at reduced costs. Data explanation: Forested counties that aren’t agricultural with no timber jobs or mechanical treatment potential [Class = G, H, I, J or K and Cluster ≠ 5]. 3.c: Non-fire fuel treatments are preferred option but supporting markets are weak. 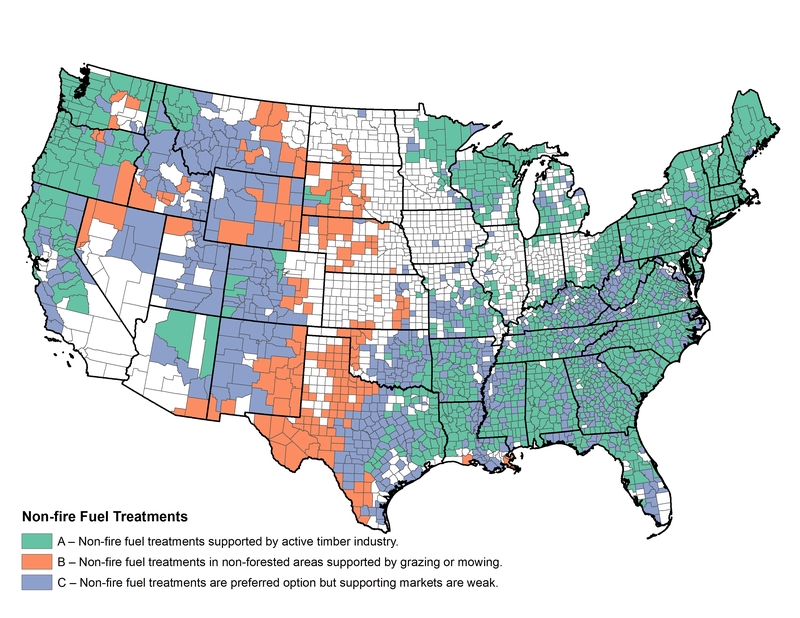 A third opportunity includes counties where mechanical treatment in forests offers considerable benefit, but where evidence of economic value or markets to support such activities is weak (Option 3.c, figure 3.5). These include major areas of the intermountain West, central Texas and Oklahoma, and scattered counties throughout the Southeast, Northeast, and Pacific Coast.